Please keep in mind the marble is antique. It is not shiny but dull and imperfect. 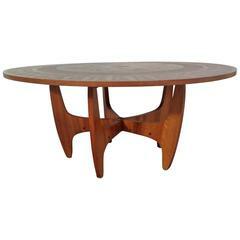 This is a beautiful round wood and glass coffee or cocktail table with brass fittings on the legs and center stretcher. The diameter of the glass inset 18" overall width 37 x 18 tall. 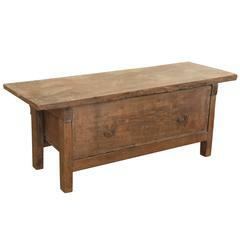 This is a rustic chestnut Spanish table with handsome iron handles on the drawer and rare single board top. 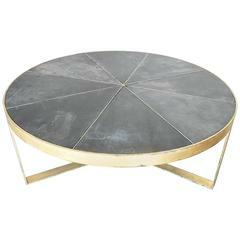 Terrific coffee table. 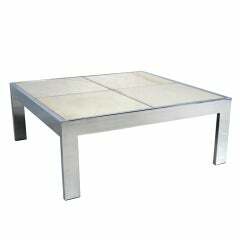 Large Chrome Coffee Table with Quartered inset Crema Marble Top attributed to the Pace Collection. 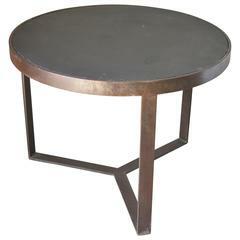 Copper leaf over wood coffee table with relief of Egyptian figures. Nice sculptural walnut base with brass details. 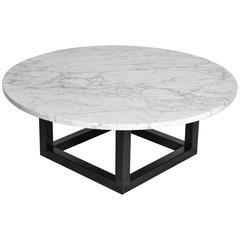 This impressive round marble coffee table is made in the USA and is made from marble and steel. 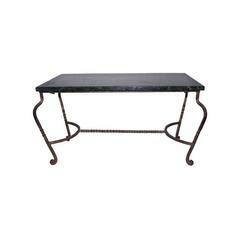 Gilt iron coffee table with green marble. 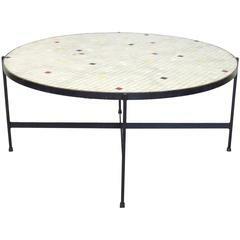 Black wrought iron with inset glass tile top coffee table. In the style of Paul McCobb. 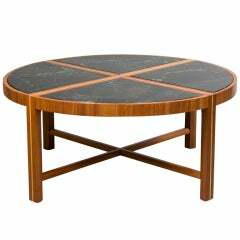 Circular low wood coffee table with four dark green marble quadrant top sections, probably Tommi Parzinger.